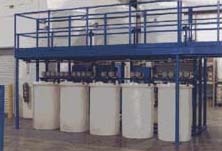 From pH Adjust or Neutralization Systems and Batch Treatment Systems, large or small, to Flow Through Continuous Sedimentation Systems and Ion Exchange Systems. 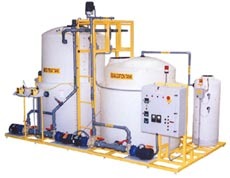 Including Pre-Treatment Systems, Clarifiers, Oil-Skimmers, Evaporators, Roll-Bed Filter Systems, Filter Presses and Sludge Management equipment. Also, Rinse Water-Recycling Systems. Our Wastewater Treatment Systems are fully integrated, stand-alone equipment systems that effectively treat process wastewater streams to comply with local standards for discharge. Whether the requirements are to correct pH, to precipitate heavy metals, to remove oils from process tanks or waste streams, to filter sediment and particulate, to evaporate with zero discharge, or to close-loop and recycle, we have the treatment technology to meet the need. 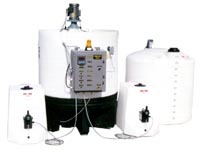 Automate-Tech’s Cyanide Destruct Systems safely breakdown harmful cyanides from waste streams. Automate-Tech’s Expandable, Gasketed Sludge Presses feature fully automatic closure, an air blow-down manifold, and a self-dumping cake cart.